Temples are the generic name for religious holdings in a county. They are one of four major settlement types, the other three being castles, cities and tribes. Christian temples are called bishoprics, Muslim temples are called mosques, Zoroastrian temples are called vahrams, Hindu and Jain temples are called mandirs, while Buddhist temples are called viharas. Temples are the only holding type which all playable government types can build. Temples are normally associated with Theocratic government. An exception is made for rulers of Iqta and Monastic Feudal realms, which allows for both castles and temples to be held without penalty; they gain monthly piety for each temple holding in their demesne. Clergy of most religions are disqualified from succession. This can be useful for managing gavelkind succession, especially for Catholics, who have frequent opportunities to invest bishops. Temple holders are otherwise normally appointed through open elective succession. Granting a temple to a courtier of your religion gives 25 piety. This often happens after holy wars. You still get the piety if you right-click the temple to generate a random vassal. Hindu characters must be of the Brahmin caste to be granted temples. Holy sites that lack a temple only give +5% to the religion's moral authority. Constructing a temple boosts this to 10%. An additional +5% is awarded if the religion's head personally holds a temple in one of the religion's holy sites; this bonus does not stack. Constructing a temple in any province also gives +1% to moral authority for 20 years. Buildings are functionally identical across religions even though their names vary. Note that building upgrades stack. All holdings have certain base statistics, providing income, fort level, and levies, so even a newly constructed holding will have some value. These buildings increase fort level, increasing the time it takes an attacking army to siege the holding and reducing the amount of free loot available to raiders. Walls increase levy size and fort level, raising the defensive capacity. They also slightly increase yearly income from the holding. Chuches are the center of the Temple holding and increase percentage-wise the number of levy and garrison troops available. They also provide piety to the liege, and holder if Muslim. 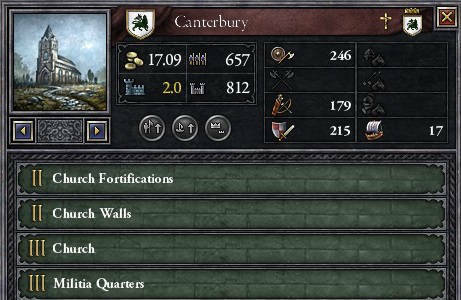 Militia Quarters increase the raw number of light infantry and archers available. These two troop types are of low quality, but make up the majority of armies and are utilised mostly in the skirmish phase of battles. Church Barracks provide heavy infantry, which are heavy hitters and important in the melee phase of battles. Church towns increase the income of the holding. Temple shipyards are buildings that can only be built in coastal provinces; they provide galleys that can be used to transport troops. Schools are educational institutions that increase the rate of technological growth in the entire county. Names varies depending on religion. +0.05 liege piety Requires an owner or any liege with the Monumental or Peaceful-Monumental bloodlines. +0.1 liege piety Monumental Shrines I Church Infrastructure III Requires an owner or any liege with the Monumental or Peaceful-Monumental bloodlines. +0.15 liege piety Monumental Shrines II Church Infrastructure V Requires an owner or any liege with the Monumental or Peaceful-Monumental bloodlines. +0.25 liege piety Monumental Shrines III Church Infrastructure VII Requires an owner or any liege with the Monumental or Peaceful-Monumental bloodlines. This page was last edited on 22 April 2019, at 02:15.